Uncategorized – Tour Real Estate Inc. If you’ve been reading along here on our blog and practicing the tips on how to get more real estate leads you’re likely already seeing results. But once the contacts start coming in from your powerfully dynamic website, as well as your frequently updating and engaging social media portal the game isn’t over – in fact it’s just starting! Just getting the leads is half the battle, but continued and increased success doesn’t stop there. Here are some good tips on how to turn those leads into seeds and plant a stronger tomorrow. First and foremost, always always follow up. That means answer the calls, return the voicemails, reply to the emails, and check the messages on your Facebook page as soon as possible. Nobody likes cold soup and nobody likes feeling like they’ve been put on the back burner, so follow up as soon as you can. Those emails that come in? Those phone calls you get? Those are all potential clients, if not now then in the future. Not everyone you come in contact with is going to be ready to use your services, and even then not everyone is going to be ready to use them right NOW. So get organized! You should be saving and creating a list of every email inquiry you receive in order to do future newsletters and mailings. The same goes for phone numbers, keep a good record of names, dates, and the number so you can circle back every so often – even a warmed over call is better than a completely cold call. You’ve got a potential client that you’ve made contact with, or maybe even spoken with a bit over the phone and you’re confident they’re ready to make the move. There’s no reason to keep things strictly online! In this day it’s easy to throw out an email and forget about it – just like it’s easy to delete them without opening them – and that makes real world contact a powerful thing. It might be a matter of doing some planning to see where your recently gathered leads all exist and doing a good old fashioned door knocking campaign in that area, or maybe even setting up a coffee meet and greet nearby. Don’t think that only new leads need to be nurtured. Fact is if you stay in the industry long much of your clientele will be repeat clients and referrals more than anything else – so treat those previous clients like the gold they are! Touch base from time to time just to check in, shake the bushes a little bit to see if they know anyone who could benefit from your services, and make sure to foster the idea that you are a professional who is available to help them long after the transaction itself is done. Don’t panic if you’re not the next real estate mogul in your first year, success takes time. There are no “dead leads” only leads that aren’t nurtured properly or for whom timing isn’t right. Think long and hard before deleting any info from your leads list as you can never tell when a past contact might become a future prospect – especially if you’re actively working to remain in the forefront of their minds. Remember, there is no down time: you should either be actively marketing to gather leads, or actively working to engage them. You can’t keep dropping the ball and expect to score. One of the best ways to stay in the game is to have an active, easy to use, and highly visible real estate website that you can use to promote your services and to provide an unparalleled tool for your clients. If you don’t have a website currently, or are unhappy with it’s performance, we would love to help! Contact us today to find out more about all of the exceptional real estate technology solutions we provide! What’s your brand? Do you even know? Have you distilled the very essence of your “you-ness” into a potion of concentrated awesome ready to hit the shelves? With market saturation at an all time high and only increasing the fact of the matter is that the consumer, your potential client, has their choice of where to find real estate these days. Brand awareness is key to building a dedicated audience supporting your success and boosting your efforts beyond mediocrity. Fortunately social media allows you to build a unique presence for yourself from the ground up! Consider these tips to brand yourself! There are more than 1 million real estate agents holding membership with the National Association of Realtors. What is it that’s going to make someone choose you? Will it be a history of proven results, a familiarity with the area or market? Some special service or marketing plan? ALWAYS wearing purple? There are any number of ways to stand apart from the competition. Think about what you do that other agents don’t, then let your audience know about it. Over 80% of potential home buyers “cyber-stalk” their agent long before they ever make contact. You need to be highly visible online, even if it’s only by ranking well for searches on your own name, or brokerage. Beyond saving time, energy, and foot work, technology resources are tools of the trade that when used properly can have stunning effect. If you’re not using them, you need to be. If you’re not providing them for your clients, you should be. You need to do more than simply have a website and forget about it; just because you are “online” doesn’t mean you have an active and viable presence. Obviously, a major part of that online presence includes central website you control; having a sub-par website, then letting it sit untouched, will actually do you ( and your visitors ) a disservice and may make you look unprofessional – damaging your brand. Your community is a great place to find your client base, to do good for others, and also boost your brand awareness. With very little searching it’s generally not very hard to find any number of local civic or social groups of which you can be a part. Get to know your community and how you can help the people there best. Despite the power of technology real world face-to-face referrals and interactions are still one of the surest ways to improve visibility for your services. Whether you are online or off, be consistent in how you represent yourself. Online this means evoking a familiar and identifiable style of content. Offline this might actually mean always wearing that purple hat, or simply by the manner in which you carry yourself or the type of events and organizations you associate with. Increasing awareness for your brand increases the equity of trust people will place in your services, leading to a greater audience as well as an overall easier sales process when you connect with potential clients. We get quite a few requests from real estate agents to “forward” their domains. They will load up on a few good keyword rich domain names because they are affordable, or to keep competition from getting them and then ask us to simply forward them to their main sites so that when the other address is typed in visitors are automatically sent to their main domain – sounds like a GREAT idea, right? It SEEMS like a good idea…Who wouldn’t want a bunch of keyword rich domain names to use for people to find them? Well, unfortunately this technique actually doesn’t yield much (if any) search engine power, and can in fact be dangerous if not handled correctly. Besides which search engines don’t give any weight to simple forwarded urls; any “link juice” they share with the site which the url is forwarding to is nominal at best. Domain forwarding will not produce any extra link juice or authority, and so will not result in increased rankings. You have a really powerful domain name that people might type into the address bar naturally (i.e. “nike.com”, “homes.com” ) – unfortunately MOST of these are long since taken. You want to redirect those who type in the wrong domain extensions (i.e. .org to .com) or misspell your URL. You need a shorter URL to use for print advertising but don’t want to move your other (perhaps older/more established) domain. You can put those other URL’s to work for you! It’s easy enough to do – either setup a blog on a service like WordPress (you can setup a blog on your own hosting through wordpress.org or wordpress.com requires a $14/yr payment for domain mapping), or create a stand alone lead capture website. Real Estate Blogs are a great way to work a niche market, like foreclosures, or offer resources to a community you are working in. They can increase your online exposure and help drive traffic to your main site. 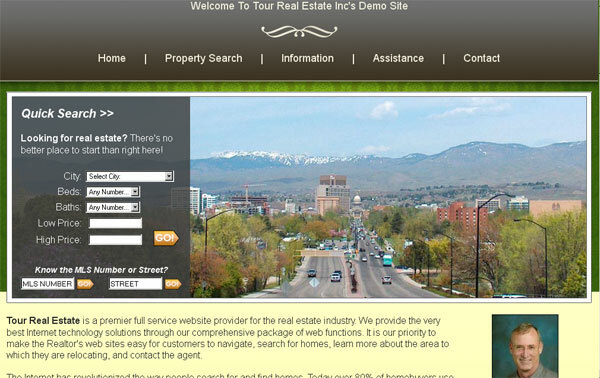 Lead Capture websites for REALTORS® are also a good choice. TourRE can provide these for as little as $50 and they act as a not only a means to drive traffic to your main domain, but also as an external source of backlinks. We hope this article has helped clear up why forwarding can be a bad thing as well as how you can still utilize those extra domain names you have lying around. Still have questions? Contact Tour Real Estate! There are a number of great reasons why real estate office sites from Tour Real Estate excel, from their powerfully dynamic content control to a myriad of social media and listing tools. But did you know that by encouraging your agents to have their own individual agent websites with us you can exponentially increase the number of backlinks to your office website? It’s TRUE! By using our built-in link exchange function you can create links in the footer of your website to all of your agent websites (giving them a powerful seo boost) as well as have each of them include links in the same way to your office website (giving your office potentially hundreds of backlinks as well). As all of our websites have a number of standard pages, as well as thousands of pages of listing results, by placing links in the footer of your website with the Link Exchange function you can create a massive flow of external links between websites. Backlinks are one of the key SEO factors that help determine your website’s placement in search engine results. Increasing the number of these type of links can help provide a more robust link flow to your office website and to your agents individual sites. Have questions about REALTOR® SEO? Not sure where to start? Don’t understand search engine optimization or social media? We can help! Our team here at TourRE understand search engines and how they work. We can provide exceptional search engine and social marketing strategies to help improve your online presence. Contact us today to find out what we can do to help you move more real estate! This newest template features an attractive zen-like design with a quick search prominently at the top. The main body of the website contains ample room for your business bio or other information, as well as our standard home page modules. As an extra bonus the top 5 newest listings randomly rotate below your contact information in the sidebar – adding valuable search engine visibility. This template comes in a few different color themes and has multiple flash slideshows for you to choose from. Like the layout buy looking for something more custom? We can customize this, or ANY of our website templates to your specifications to help you stand out from the crowd with custom colors, branding or other functionality. Tour Real Estate makes it easier than ever to publish your listings to Facebook and Twitter! We love seeing our REALTOR website clients making the most of the internet by leveraging social networks; we love giving them the tools to make it happen! As one more part of that passion we’ve made it possible for our clients to send their listings directly to today’s most exciting social networks! Simply login to your Client Toolbox, click Your Listings on the left, choose the listing you want to publish by clicking it’s MLS ID; on the page that opens click the Facebook or Twitter icons. You will then be prompted to login to those systems like you normally would and even include a customizable message with the post! Are you a real estate professional who is harnessing the power of social networking to move more real estate? We’d love to hear from you! Share your success stories with us on our Tour Real Estate Fan Page. Not on the social networks yet? Are you confused regarding how you can use social network marketing? We can help! Contact TourRE today for the best in REALTOR social network marketing! Tour Real Estate Inc, your provider of the best REALTOR® websites and marketing has just launched our new real estate map search! Widely available for our S W Idaho REALTOR® website customers – with a later expanded launch for clients in other areas already in the works – TourRE clients will now have 3 main ways to search within their main property search area: Quick Search, Map Search, and our Standard Search. 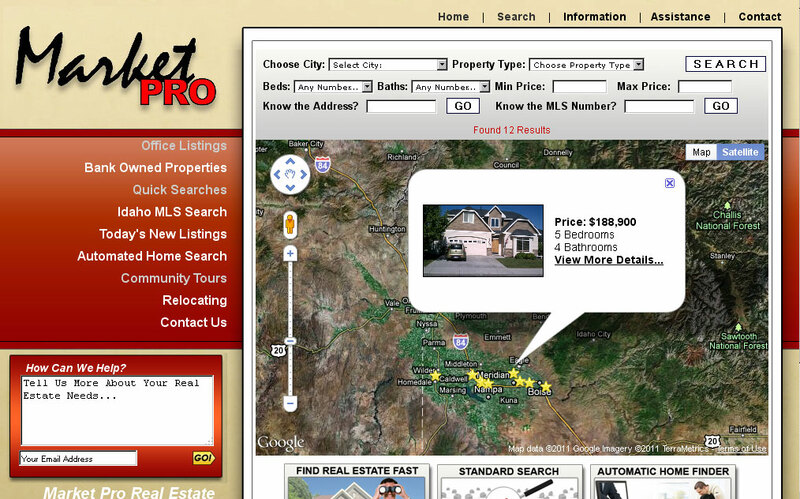 Quicksearch allows visitors to enter an address or mls number as well as search by city, school, or subdivision. Standard Search provides a basic set of standard search criteria like beds, baths, property type, and price – as well as an optional “advanced search” if they are interested in finding property with specific features. Map Search is version 1 of our latest development, an integrated Google based real estate map search by beds, baths, property type, and price range with results displayed right on the map in order to allow your visitors to see the area around the properties they are interested in. This is just the latest in a wide variety of excellent tools and functions that your dedicated team here at Tour Real Estate are developing in order to help you drive more traffic to your site and move more real estate! Not a TourRE client? Is your website outdated, hard to use, or invisible in search engines? WE CAN HELP! Contact Tour Real Estate today to find out what we can do to help you develop your digital presence and put your website to work for you!